Back in the paddle wheel days, there were not many ways to import goods to the Okanagan. Railroads were not built until 1892 which was still a long way off, and roads were not that great, especially with nothing economically feasible to transport the goods with. The cheapest and easiest way by far was on water via the Thompson-Shuswap river system. However, there was no water route between the Shuswap (Spallumcheen) River and Okanagan Lake (there was a canal planned but it proved to be too costly, and was never built.) The best that could be done was to take the goods as close to the lakes as possible, and take them overland. Once they got there, there was no problem re-loading goods back onto a steamer and moving the goods up and down the lakes. 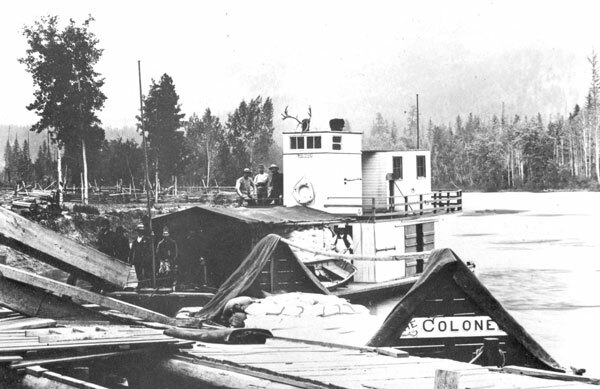 The townsite of Enderby is this closest point, and all goods destined for the Okanagan had to be taken as far as Enderby by paddlewheeler, then off-loaded and taken over land as far as Okanagan Lake. This fact alone is responsible for the location of Enderby today. As for the boats that travelled the Shuswap River, they are listed below in order of appearance on the river itself. Kamloops (#1) was the first boat known to have come up the Spallumcheen, and was built in 1872. The boat itself had 4.0 horsepower, had a registered tonnage of 11.79 and gross tonnage of 21.08. Captain Meneteau used her to carry freight, supplies; she was also used by the surveying crew for the C.P.R. But the Kamloop's most famous "cargo" was the first white woman settler up the Shuswap River to the North Okanagan; on Sept. 19, 1874, she carried Mrs. A.L. Fortune to Fortune's Landing. To emphasize the event, the Kamloops pulled into the Landing (Enderby) with whistle blowing and the Union Jack and Stars and Stripes flying. Last run of the Kamloops was in 1878. Spallumcheen, also known as "Noisy Peggy" to those who couldn't pronounce her name properly, was built in Kamloops in 1878 by Alex Watson of Victoria. Captain Ashbury and Captain August Men navigated her from Savona's Ferry and Eagle Pass Landing (Sicamous) to Enderby carrying freight and a maximum of 25 passengers. The old threshing machine engine that operated the 80 foot sidewheeler had 4.0 horsepower, and was very noisy. The ship was 17 feet wide, 5 feet deep and had a gross tonnage of 54 and register tonnage of 51. Lady Dufferin, was very similar to the Spallumcheen and was built to relieve some of the "stress" of heavy loads put on the Spallumcheen. This sidewheeler was built in 1878, and was piloted by Captain Mewha to carry a total of 25 passengers and 60 tonnes of freight, 52 which were registered. Her 10.2 engine powered her 87.5 length, 16' breadth, 5.5' depth, and was used between Savona's Ferry, Eagle Pass Landing, and Enderby. SS Peerless, was built in 1881 and, at this point, became the largest boat in the Shuswap. She was 133' long, 25.5' wide, 5' deep, had a gross tonnage of 307 and registered tonnage of 256. Her 53.04 horse power engines carried a capacity of 200 passengers plus freight to a cruising speed of 18 knots (same speed as most BC ferried today!). We do not know how often captains J.D. Tackaberry and J.W. Troup brought the Peerless up to Enderby, but they did so several times. The Red Stars were by far the most important vessels to Enderby history. They were primarily built to carry flour out to Sicamous where it could be loaded onto the train and shipped elsewhere, but they had other uses as well. Red Star #1 was built and registered in Victoria in 1887 and owned by the Columbia Flouring Company with the office in Enderby. It was used to carry flour and mail, could carry a maximum of 12 people, and usually towed scows (barges) from Enderby to the mainline of the C.P.R. at Sicamous and back. It had a 1.5 horsepower engine, was 33 feet long by 9 feet wide with 3 feet depth. They soon found out that the Red Star #1 drew too much water (because it kept running aground in low water), so they took the machinery off her and put it on another hull which then became known as the Red Star #2 . The first hull was purchased by Alex Porteous, Allan Gillis and Roland R. MacDonald. They added 20 feet to it and called it the Okanagan. It was later resold and moved to Okanagan Lake. Red Star #2 was built in Enderby in 1888 for R.P. Rithet, who owned the Columbia Flouring Mill. This boat was used for basically the same purposes as the Red Star #1 (carry flour, other freight, passengers, and the mail), making regular runs down to Sicamous Monday, Wednesday, and Friday, coming back to Enderby Tuesday, Thursday, and Saturday. We know that #2 was 57 feet long by 14 feet wide with 3 feet depth, had 36.95 gross tonnage and 25.70 registered. Although this Red Star had less trouble than the first, it would also get hung up from time to time on the sand bars in the river (giving it the nickname of "Slow Molasses"). This made time scheduling difficult because sometimes the boat would be stuck for hours, and other times it was clear sailing. 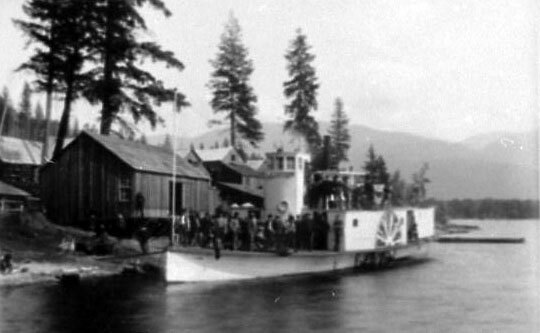 The Red Star was finally abandoned when a connecting railroad line came through to Okanagan Landing from Sicamous, eliminating the need for a vessel. SS Thompson was run by Captain Monteith as a log-towing vessel, although she was built to carry a capacity of 60 people in 1895. The boat is known to have taken people to the May 24th Celebration (Victoria Day) on at least one occasion. She was 94.3' long, 19.6' wide, 4.6' deep, had a gross tonnage of 149.8 and a registered tonnage of 94.38. 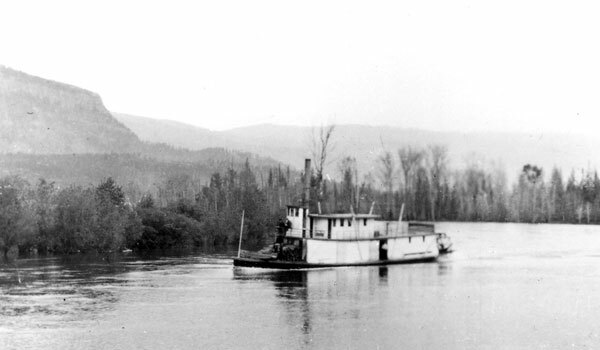 Ethel Ross was 84' long and 14' wide built in 1897, and was mainly used as a logging vessel on the Thompson-Shuswap River system.